Each year we celebrate the festive holiday season with UT Staff, Faculty, Administrators, Community Leaders, Friends & Guests. We also honor the contributions of faculty and staff to BFSA and the university community. 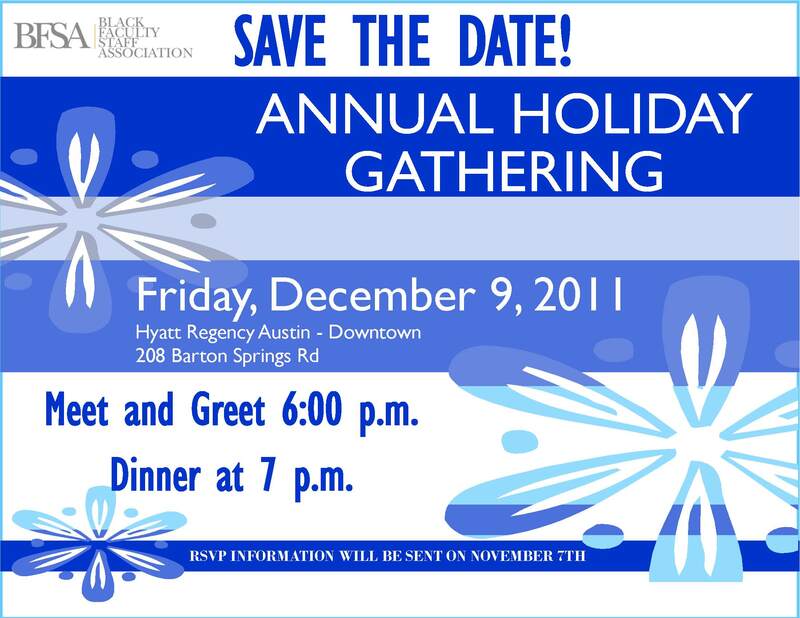 We are happy to announce the Black Faculty and Staff Association’s Annual Holiday Gathering, on Friday, December 9, 2011. The event will be held at the Hyatt Regency Austin-Downtown at 208 Barton Springs Road. This is an opportunity for us to show our appreciation to our membership, award our Dr. James L. Hill Education Scholarship, and be thankful for another year of success as an organization. IMPORTANT! There is limited space at this event which will provide a dinner, entertainment and evening beverages. Your spot at this event is NOT confirmed until you RSVP and receive an email confirmation from LT Robinson, President of BFSA. Preference for a space will be given to members who have currently paid their dues to the organization (for the 2011-2012 academic year), invited guests, and dignitaries. UT-Austin Black Faculty Staff Association’s photostream on Flickr. There was plenty of cultural food to enjoy at this fun event held on November 8 at the Ernest Cockrell Jr. Hall on campus and attended by members of each of the four University Resource Groups (URGs). The event was very well attended and gave URG members and guests an opportunity to visit with staff from across the campus.